A large selection of shark species are available to catch in the near-shore waters of Florida’s east central coast and they are easy to catch. 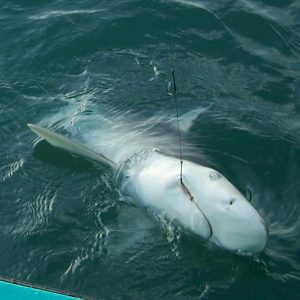 Shark fishing is great fun, but I have two shark rules that apply to my charters: Rule one, no live sharks are allowed in my boat, Rule two, I do not kill sharks. So if you are interested in killing sharks, please select a different charter service. No live shark allowed in boat. I do not kill sharks.